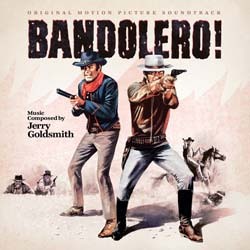 La-La Land Records and 20th Century Fox present the original motion picture score to the 1968 Twentieth Century Fox feature Western BANDOLERO!, starring James Stewart, Dean Martin, Raquel Welch and George Kennedy, and directed by Andrew V. McLaglen. Long out of print, this delightful western score from legendary composer Jerry Goldsmith (RIO LOBO, PATTON, THE OMEN, BASIC INSTINCT) returns to CD sounding better than ever and featuring the Main Title, sans whistle, as a new Bonus Track. Produced by Nick Redman and Mike Matessino and mastered by Matessino, this special release is limited to 2000 units and features exclusive liner notes by writer Julie Kirgo. I am fan of Jerry Goldsmith as one of the great composers of the last 60 years, in this little romp of musical merriment. I can say "Just Whistle For Me"!